Here's a better look at charming little Alexander in his baby-sized Seraphim sash, which he promptly employed as a teething chew. 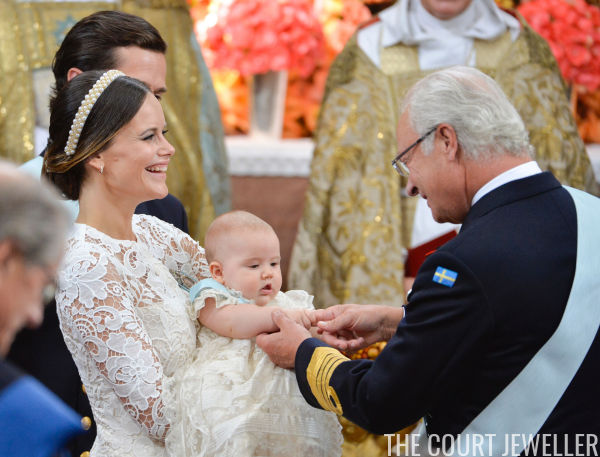 Alexander's mother, Princess Sofia, chose small diamond-encrusted hoop earrings for her son's christening. 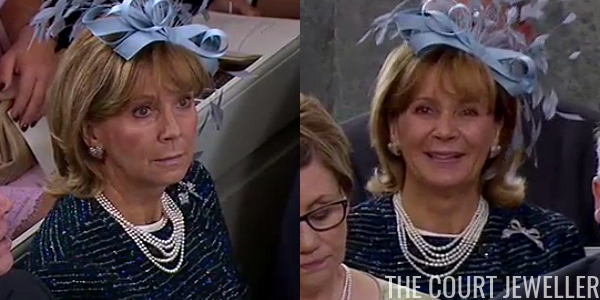 In lieu of a hat, she wore a pearly headband-style hair ornament. Here's another angle on both the earrings and the hair ornament. 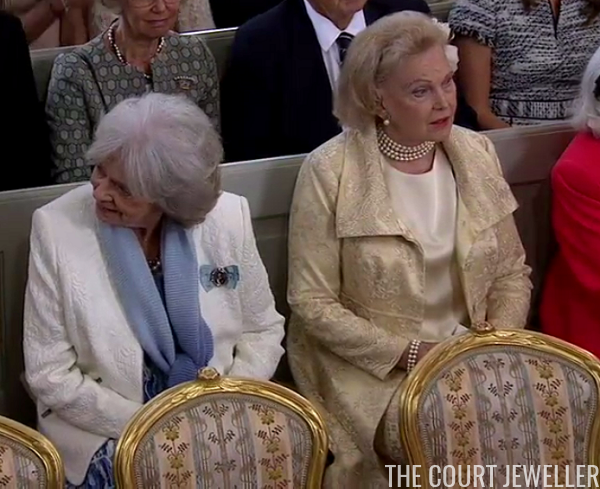 Queen Silvia, Alexander's grandmother, wore pearls for the christening: pearl drop earrings, a single-stranded pearl necklace, and a pearl bracelet. 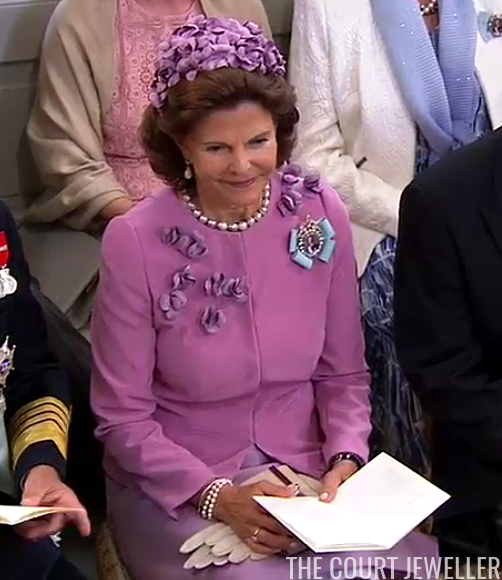 Like the other senior women of the Bernadotte family, she also wore King Carl XVI Gustaf's family order. 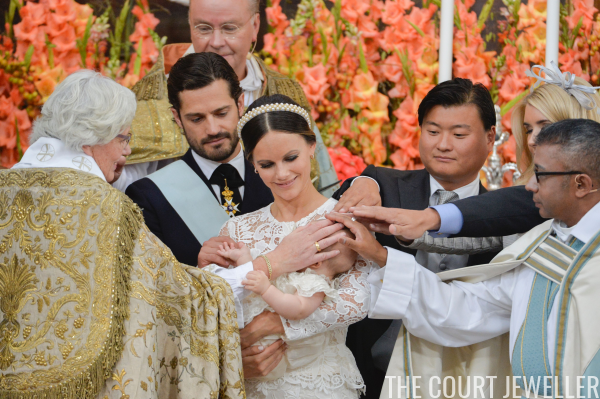 Crown Princess Victoria is both Alexander's aunt and one of his godparents. 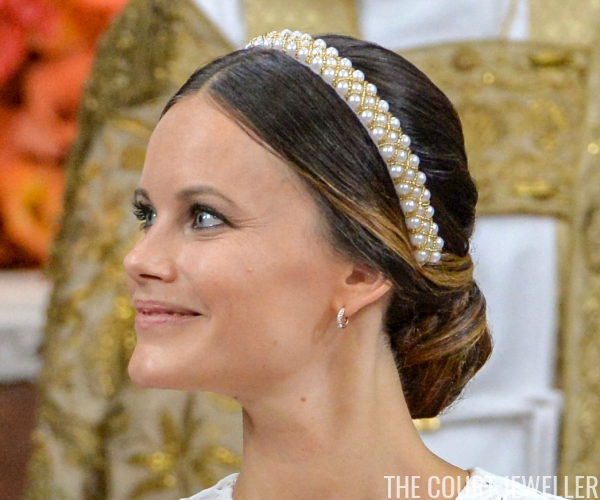 She wore the same Kreuger earrings that she wore at the christening of her other Swedish royal godchild, Princess Leonore, plus rings and delicate bracelets. 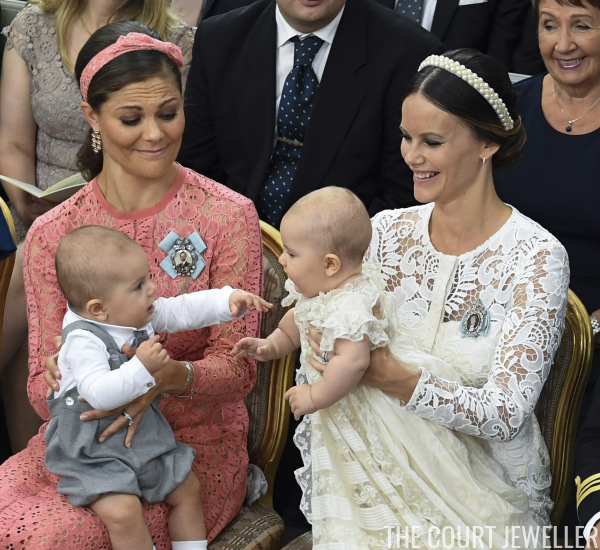 Her best accessory, though, was her baby son, Prince Oscar, who kept his cousin entertained over the course of the service. 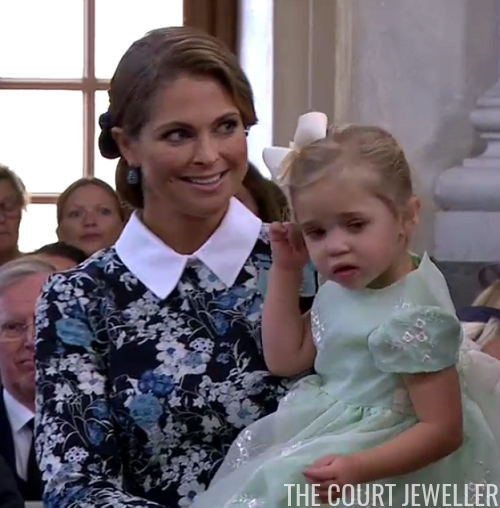 Princess Madeleine, Alexander's other royal aunt, wore drop earrings that coordinated with the blue tones of her floral dress and carried her daughter, Princess Leonore. A few members of the extended Bernadotte family were also in attendance. The only one of the king's sisters to attend was Princess Margaretha. It was tough to get a good look at her jewelry, but she appeared to be wearing at least a single (possibly double) strand of pearls. On the right is Countess Marianne Bernadotte af Wisborg, who is the widow of Prince Sigvard, the king's uncle. She wore a multi-stranded pearl choker necklace, a pearl bracelet, and pearl earrings. 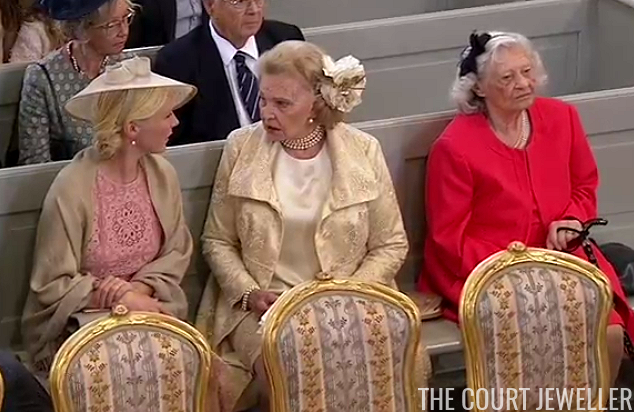 Here are two more family members sitting with Marianne earlier in the service. 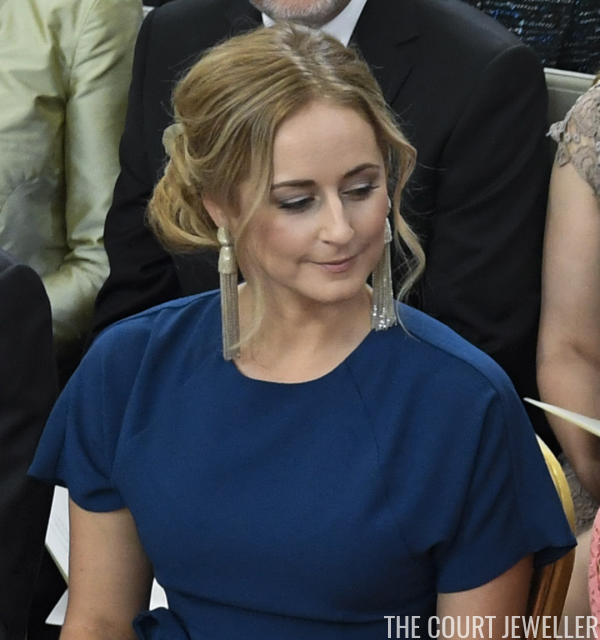 On the left, wearing pearl earrings, is Frida Bergström, who is the partner of Victor Magnuson, the youngest son of Princess Christina (the king's sister). Victor is one of Prince Alexander's godparents. On the right, wearing a vivid red coat with pearls, is Dagmar von Arbin. She is the daughter of the late Count Carl Oscar Bernadotte af Wisborg, who was the son of Prince Oscar Bernadotte -- who was a son of King Oscar II and Queen Sofia of Sweden. Dagmar is the oldest member of the Bernadotte family; she celebrated her hundredth birthday in April. One foreign royal lady attended the christening: Princess Ursula of Bavaria. (Her husband, Prince Leopold, is one of the godparents of Alexander's father, Prince Carl Philip.) She wore a delicate, multi-stranded pearl necklace with a diamond bow brooch. 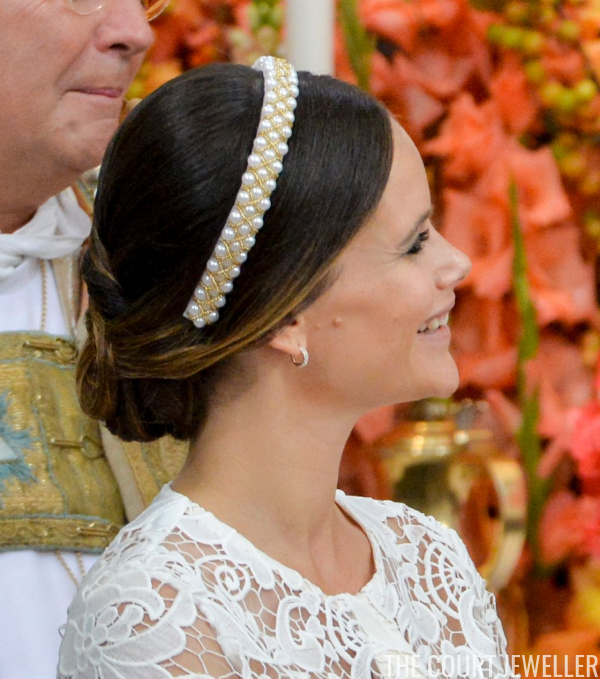 She's not a royal, but I thought you'd all be interested in the tassel earrings worn by Lina Frejd, Princess Sofia's sister (and one of Alexander's godparents). 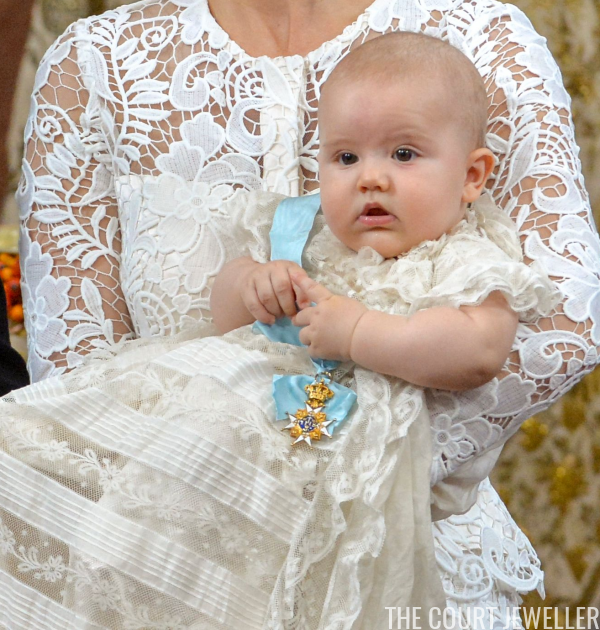 Which of the jewels from today's royal christening were your favorites?